08 | August | 2011 | Through the seasons before us..
Meet Big Norm and get a free book! 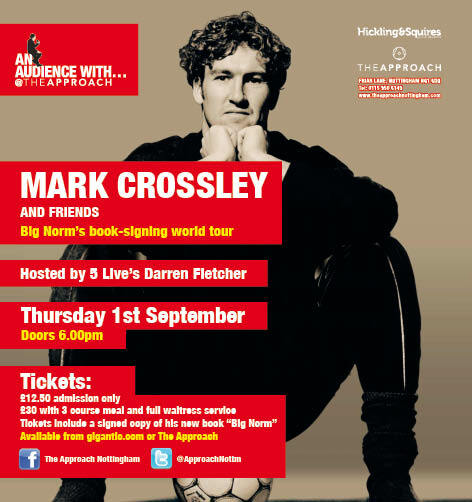 If you’ve a clear diary on the Thursday 1st September then you could do a lot worse than pop down to The Approach to take in an Evening With Mark Crossley (and friends!). For just £12.50 you get entry AND a signed copy of his new autobiography “Big Norm – Looking After Number One”. For anyone who hasn’t seen Norm’s after-dinner efforts before, it’s certainly a cut above the usual mumbled stories being painfully dragged forth from the poor compere (not that I’ve seen many like that either, to be fair). Norm is a genuinely amusing and quick-witted speaker, and with an armoury of stories to reel off too, always good value to listen to. If you have seen him before, then there’s promise of new material he’s not covered before. You could also opt to have a sit down meal with waitress service for just £30 – similarly also including a copy of Norm’s book. His autobiography promises to be a cracking read – I already have a copy awaiting me to get around to reading it, which I’m looking forward to if only I could find the time to get cracking on it! Tickets are available from The Approach in person, or online by using Gigantic.com.